Where is the Best Implant Dentist Near Me? If you have recently made the choice to replace missing teeth with dental implants, you are probably wondering, “where is the best implant dentist near me?” Look no further. Muskingum Valley Oral Surgery will perform your implant placement procedure. Working closely with your general dentist, Dr. Jeff Lee and his dental team provide the high-quality care you need for accurate, successful results. Dental implants have quickly become the most preferred solution to replace missing teeth, which is why more than 500,000 dental implants are placed each year. When performed by the hands of a skilled oral surgeon, you benefit lifelong solution to treat tooth loss that offers over a 95% success rate. 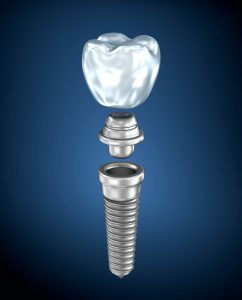 The process to receiving dental implants can be quite complex, which is why most general dentists do not perform the procedure. Most often, you will be referred to an oral surgeon, like Dr. Lee, to handle the implant placement and any other necessary surgical procedures. Unlike a general dentist, Dr. Lee has undergone extensive training in oral surgery and dental implants. Upon completing his dental degree at The Ohio State University College of Dentistry, he then completed a four year residency in Oral and Maxillofacial Surgery at the Ohio State University Wexner Medical Center. Through his vast academic and career success, he is also a part-time faculty member in the Oral Maxillofacial Surgery Department at the Ohio State University College of Dentistry. As a highly skilled and award-winning implant dentist, he is the perfect choice to handle your multi-phased treatment process to replace the root and crown of the tooth. To begin the process, you will require a thorough consultation to determine if you are a candidate for the procedure. In most cases, as long as you have good oral health and general health, as well as adequate jaw bone density, you are a candidate. Using a CT scanner that is not available in most dental offices, Dr. Lee will assess your bone health and bone density to determine if any additional procedures are needed prior to the implant placement, such as bone grafting. If any additional procedures are needed, Dr. Lee offers the extractions and grafting needed to ensure the success of your implant procedure. Using the images, Dr. Lee then creates a comprehensive treatment plan for the precise placement of the implant posts. A surgical procedure is used to place the dental implants into the jawbone. Over the course of the next couple of months, your jawbone will then fuse to the implant posts to replace the tooth roots while providing a secure foundation for the replacement teeth. After your jawbone is healed, Dr. Lee then performs the second phase of treatment—attaching the healing caps. The gum tissue is opened to expose the dental implant. The healing cap is than placed on the post to allow proper healing of the gum tissue. The final phase of treatment involves placing the restorations. Dr. Lee uses cutting-edge technology to make digital impressions with the Trios3 IntraOral Scanner to create your custom-made restorations. The restorations are attached to the healing caps to give you a complete smile. As a qualified implant dentist in Cambridge, Dr. Lee will perform your entire dental implant procedure, including any necessary procedures before the initial implant placement. With a Master of Science degree in the area of dental implants, you are in good hands with Dr. Lee. Start your journey to a complete smile. Contact your implant specialist at Muskingum Valley Oral Surgery today to schedule your consultation. Comments Off on Where is the Best Implant Dentist Near Me?